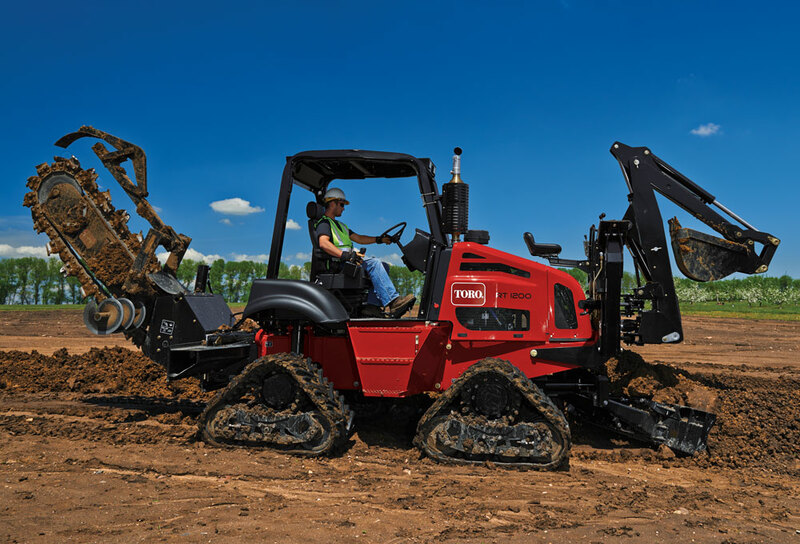 This promotional photo of the Toro RT1200 riding trencher is an eye-opener. The tool-carrier chassis rides on four triangular rubber tracks with a backhoe mounted on the front above a blade. A trencher bar is mounted in the rear. It smacks of a Rube Goldberg contraption. “And a rock saw isn’t even shown,” Neil Borenstein says, with a chuckle. The Toro marketing director concedes that the versatile trencher unit is a workaholic machine. “It is a little comical because the backhoe on the front doesn’t look like it belongs. But a lot of RT1200s go out the door with a backhoe on the front.” Other brands of large trenchers are similarly configured. The Ditch Witch RT125 has tilt frames to keep the sides of trenches aligned and front-and-rear steering for a relatively tight turning radius despite its size. The original “endless conveyor ditch-digging machine” introduced 70 years ago by Charlie’s Machine Shop in Oklahoma and called a “Ditch Witch” had a molded iron tractor seat on it for the operator. But many next-generation DW machines were walk-behind models. Today, trenchers with seated operator platforms are top-of-the-line machines. The Ditch Witch RT1200 can even enclose the operator in a heated and air-conditioned cab with front and rear windshield wipers and pressurization to insulate against noise and dust. 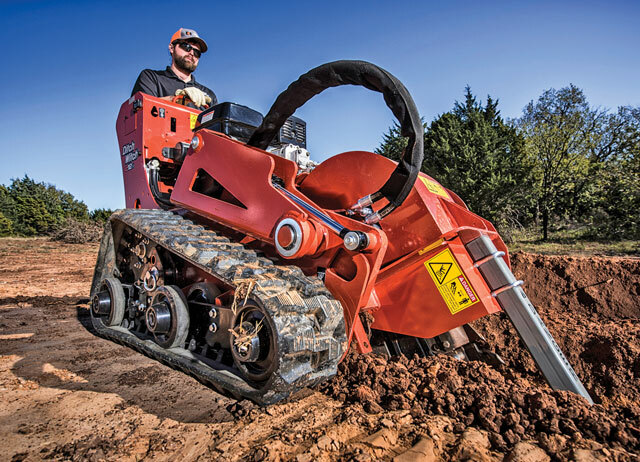 Ditch Witch’s first trencher was powered by a 7-hp engine and cost $750. By comparison, the Toro RT1200 has a 121-hp Cummins diesel under its hood. It carries almost 50 gal of fuel and moves on 18.5-in.-wide rubber tracks via a four-speed shift-on-the-fly hydrostatic transmission. 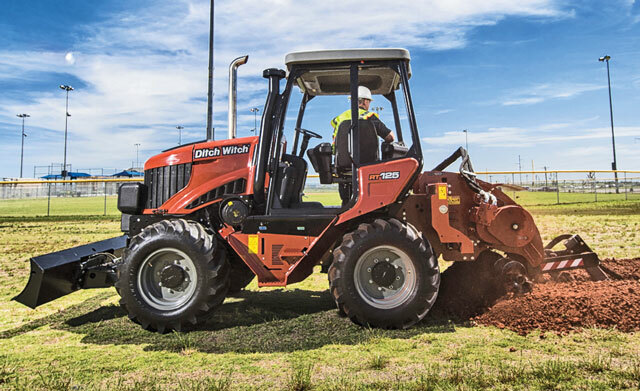 The big trencher is, in other words, a sophisticated tractor unit and a world apart in technology — and price — from Ditch Witch’s progenitor machine. Big is popular. Ditch Witch itself manufactures an equivalent 121-hp machine, the RT125 Quad, with a four-cylinder Deutz diesel Tier 4 Final engine. These large, mobile, digging machines feature tilt frames to keep the sides of trenches aligned with the vertical. They have front-and-rear steering for a relatively tight turning radius despite their size (an RT125 is a 7 1/2-ton machine, without attachments). Things like a cruise control system on the Ditch Witch RT125 Quad that lets the trencher automatically slow or quicken its forward movement according to the resistance of the material it’s slicing through. Or Vermeer’s Auto Plunge system that regulates downward pressure on a chain bar when it’s being introduced to the ground, extending the life of the digging teeth, and its Trench Sense system that automatically reverses movement and its digging chain when the in-the-ground implement encounters a rock or root. “It takes the human interface and errors out of it,” is how Vermeer’s Savage describes automation. Ditch Witch has seven walk-behind units (the C12X pictured), one stand-on unit, six seated-operator rubber-tired units, three seated quad-track models and a couple of micro machines. How many models of trencher/plows does a manufacturer really need to cover the market? After looking at three competing lineups, the answer is not obvious. Ditch Witch, which invented the industry, offers models ranging in engine size from 12 to 121 hp. It has seven walk-behind units, one stand-on unit, six seated-operator rubber-tired units, three seated quad-track models and a couple of micro machines. Vermeer’s lineup is slightly smaller. The manufacturer has just 11 models including “pedestrian” (walk-behind) and walk-beside units, rubber-tire and rubber-track models, a steel-track-only unit and a remote-controlled vibratory plow. Learn more about trenchers here.